Simone Toth credits the SF IABC network for helping her land her current communications role. Simone Toth loves being in perpetual motion. Simone and her family have moved around, “more times than folks would believe.” Recently, when Simone’s husband was offered a job in San Francisco that he couldn’t turn down, the wheels of motion began to turn again—time for the coast. Braving the winter elements, Simone, her hubby, their two dogs (and a fish) packed up their moving truck in Colorado and began their westward journey. “You don’t know fun until you’ve driven through a snowstorm . . . in December . . . at night,” Simone says. Never one to sit still, as soon as Simone and her family settled in San Francisco, she began formulating her job search plan. With thousands of qualified applicants, the communications job market in the Bay Area was really tight. Yet, Simone was undeterred. Simone first joined IABC in 2000, while working as a reporter for the San Diego Business Journal. In tandem with her many subsequent relocations, Simone maintained her involvement in the IABC community—and credits the organization with many professional and personal insights. Earlier this summer, a conversation that Simone had with a fellow SF IABC member about helping out on one of the SF IABC committees proved to be quite fortuitous. 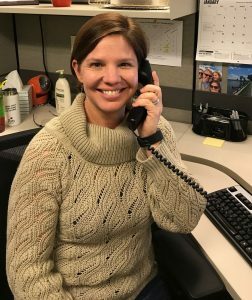 Since October, as a communications writer with Delta Dental California in San Francisco, Simone enjoys helping everyone on her team with writing and editing projects. Engaging with Delta Dental’s dentists and customers is also a great fit for Simone, as she prefers internal communications. Maintain your network, even after you are happily employed. The world is small, so never burn bridges. Allow yourself to feel frustrated. It’s perfectly okay to have a bad day and then start over the next day. Tell everyone you know that you’re looking (if you can). Someone always knows someone who knows someone. Keep an open mind about where you might work and what type of work you might do. Simone says she enjoys the annual IABC conference, as it instills a feeling of “conquering the world,” as an intrepid communicator. She also enjoys the local events hosted by the SF IABC chapter. Ayanna N.S. Anderson is an SF IABC board member and communications professional with 20 years of experience in community relations, marketing, public relations and program administration. Ayanna evangelizes the gift of life made possible through organ and tissue donation in her current role as the East Bay regional senior community development liaison for Donor Network West, a nonprofit organization dedicated to saving and healing lives.